Watch the magnificent scenery of the St. Croix Valley roll by as you travel down the line sipping on a glass of champagne or sparkling juice with family or friends. Scroll through the schedule below to make your online reservations. All reservations must be made before 6pm the Friday prior to your reservation. Attire is casual. Questions? Please call (651) 228-0263 to get help with your reservations. All reservations must be made by 6:00 pm the Friday prior to your reservation. 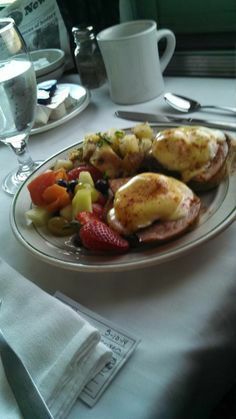 Brunch Menu is hard-poached eggs benedict, herbed American fires, and fresh fruit medley. Scrambled eggs are available upon request and we can accommodate gluten-free, dairy-free, or a vegetarian meal only when notified in advance. Use the arrows below to view available dates and times to ride. Click on the "Tickets" button to book your reservation.